This chapter addresses a number of questions that might arise as you develop your productive skills assessment tasks. 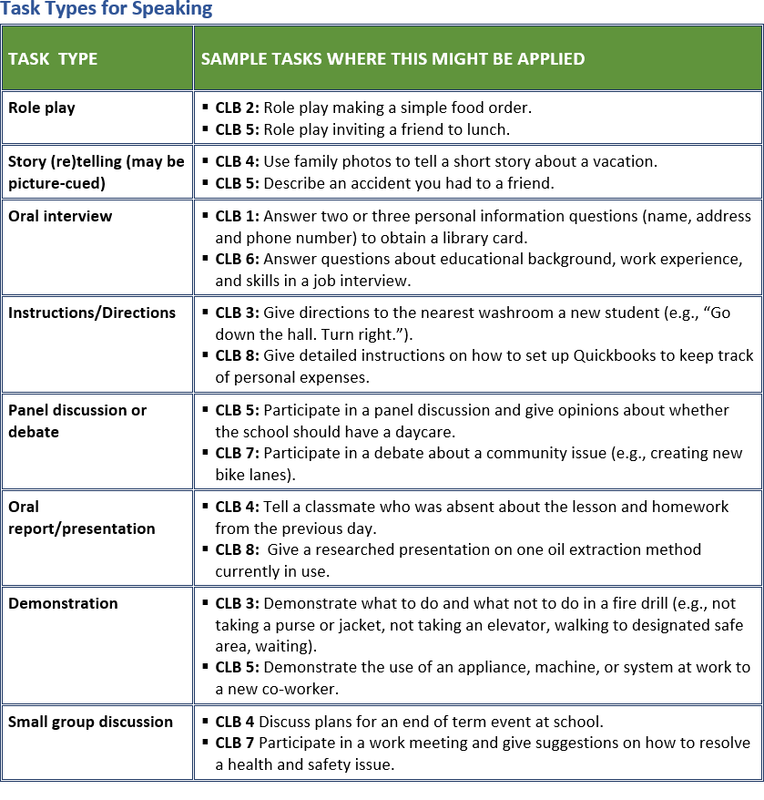 We begin by suggesting a number of task types that might be useful in your classroom, before demonstrating how you might use the CLB 2012 document to align your task to the abilities of the learners in your class and to select your assessment criteria. We end by discussing special concerns related to setting up productive skills assessment tasks. In order to assess learners’ productive skills you will need to develop assessment tasks that allow learners to demonstrate real-world speaking and writing skills – skills that will be useful in their interactions outside of the classroom. You have as many options for task types as there are speaking and writing opportunities in the real world. The two charts below describe several options that have worked well in Adult ESL classrooms. As with all assessments, you can use the CLB 2012 document to check that the speaking or writing assessment task aligns to the CLB level(s) of the learners in your classroom and that the assessment criteria align with the CLB level. The steps below outline this process using the example task, Send an Email about a Trip to a Co-Worker, for CLB 4. The CLB competencies are organized into four Competency Area(s) located to the right of the Profile of Ability for each benchmark; for speaking and writing these include Interacting with Others, Giving Instructions/Reproducing Information (writing only), Getting Things Done, and Sharing Information. As a first step, select the competency area(s) that most closely reflects the purpose of the task. For example, in the task Email a Co-Worker about a Trip, the purpose is to describe a personal experience, so Sharing Information (communication to inform others) is appropriate. If the email also included a few sentences for the purpose of sharing and making enquiries of a personal nature (e.g., health, family…), you could consider adding the competency Interacting with Others. Once you have selected the assessment task, you should confirm that the task (and your expectations) are appropriate for the CLB level of your class. This involves a scan of the Profile of Ability, Some Features of Communication, the appropriate Competency Area(s) and the Knowledge and Strategies page. 1. The Profile of Ability is listed on the left of the page for each speaking or writing benchmark (and also provided in table form at the beginning of each Stage). If your task is at Writing Benchmark 4, for example, the Profile of Ability (pictured to the right) indicates that learners would be expected to write short, simple texts about personal experiences and familiar topics. The expectations for the communication are also summarized: among other expectations, it should be grammatically and lexically simple, and intended for a familiar reader. These considerations would remind instructors to set up the sample task, Send an Email about a Trip to a Co-Worker, in a way that allows learners to write a short text about their trip, using simple language, for a familiar reader. The Profile of Ability also describes the strengths and limitations of communication demonstrated by learners at this Benchmark. It indicates expectations for knowledge of language, range of vocabulary, and use of coordinate clauses, among other features of communication. 2. 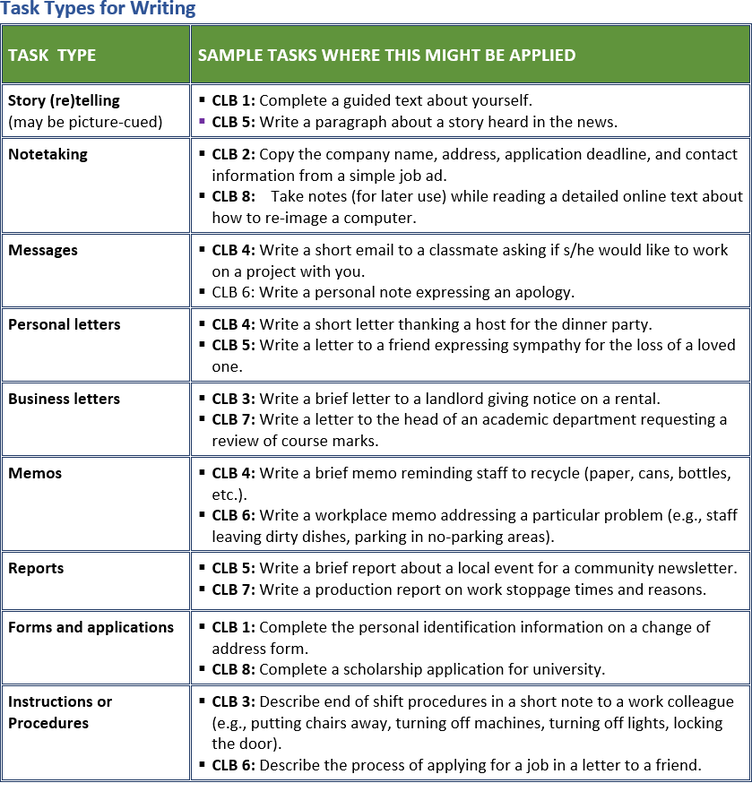 The Some Features of Communication table for writing found at the end of Stage I Writing (with the CLB 4 column presented here, to the right), expands on characteristics of written communication for each Stage I benchmark. At Benchmark 4, the Some Features of Communication table stipulates that in addition to communication being grammatically and lexically simple, and intended for a familiar audience, prompts would be simple, and forms would be limited in length, along with other considerations. In the example task Send an Email about a Trip to a Co-Worker, the features indicated by the arrows in the chart might be particularly important: learners should be able to use an informal style, and the prompt should be simple, calling for responses of about one paragraph. 3. As a next step, you might scan the Competency Statement(s) and Sample Indicators of Ability of the selected Competency Area(s) for additional information that confirms the task is level appropriate. At CLB 4, the competency area Sharing Information states that learners should be able to “Write a short paragraph to describe a familiar situation… personal experience….” This expectation would be consistent with the sample task, asking learners to send an email to a co-worker to describe a trip. The Sample Indicators of Ability listed under each Competency Statement are listed in orange. In the box reprinted here, describing the Competency area Sharing Information, the sample indicators of ability indicated by arrows would be relevant to the task: uses basic paragraph structure, follows most spelling and punctuation conventions, and describes the situation adequately so that a reader can follow. 4. 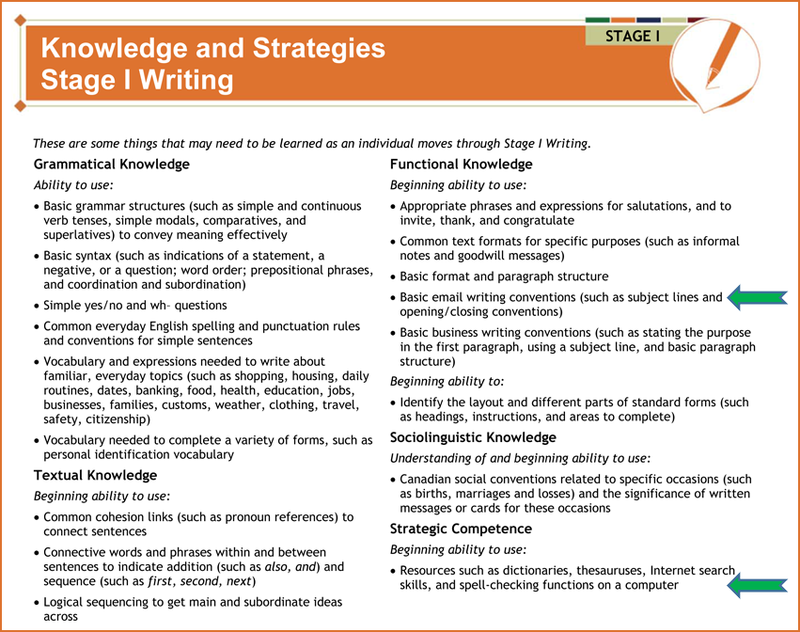 For additional ideas for indicators that may be appropriate to the task and benchmark, you should also review the Knowledge and Strategies pages for the Stage, reprinted below. In the email to a co-worker task, you might select items such as those marked with arrows below. Choose criteria most critical to effective communication in this task. For example, when speakers are making introductions, the appropriate use of non-verbal features (eye contact, handshake) is critical to effective communication. In another conversational situation, effective use of conversation management strategies might be critical, for example, using questions to extend the conversation. Ensure the assessment criteria relate to classroom teaching and learning. For example, if the assessment task will require the use of sequence markers, the markers will have been taught or reviewed in class. Adequate control of simple structures with some coordinated clauses. To determine what constitutes success at the task level, you will consider the assessment criteria that you have chosen, and choose those that are most important to success in the task at hand. These will be your criteria for task success. You should limit the number of criteria for task success to what is manageable – both for the learner and for yourself, as the person assessing and giving feedback. Begin by asking which assessment criteria are most important for effective communication in this task. Instructors often identify holistic criteria (showing overall effectiveness) and analytic criteria (specific criteria related to the quality of communication). For example, in the CLB 5 speaking task – In a Small Group Discussion, Plan an Event; Discuss Different Options and Come to an Agreement – you might decide that a learner’s overall participation in a discussion must be clear (a holistic criteria), in addition to the specific criteria that the learner expresses opinions, agrees/disagrees appropriately, and employs strategies to check understanding (analytic criteria). 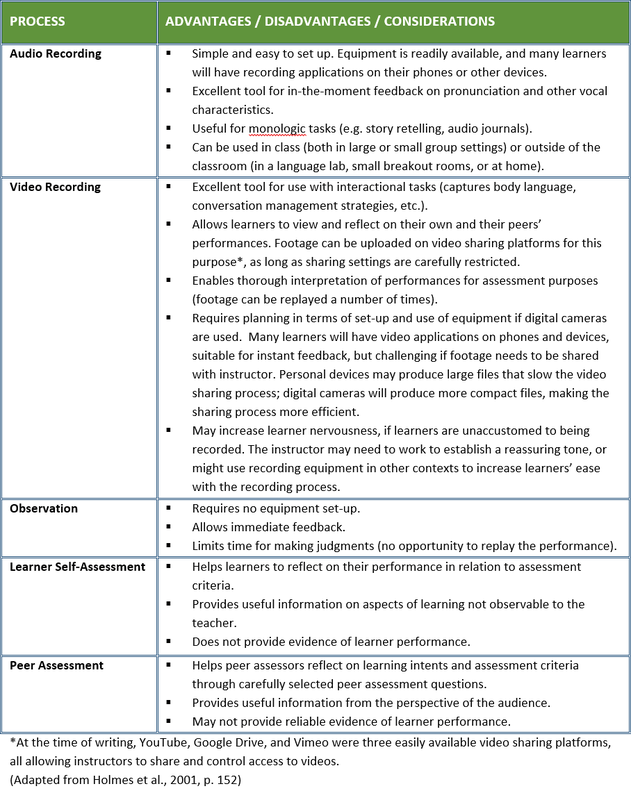 These criteria and the level of performance expected would be shared with learners and included in the assessment tool. In both Classrooms 1 and 2, the instructors use assessment tools that indicate overall/holistic and specific/analytic criteria for task success, and the expectations regarding the number of these criteria that must be met if the learner performance is to be deemed successful. If the purpose of the task is assessment of learning, you will need to decide what constitutes success. One approach would be to highlight which criteria must be met to achieve success. Another is to use a numeric score, in which case you will need to indicate the overall score or percentage required for success. You might consider weighting the most important assessment criteria more heavily than other criteria. For example, in a CLB 2 speaking task, whether or not the message is complete might receive greater weighting than pronunciation or sentence structure. What Special Considerations Arise when Setting Up Productive Skills Assessments? In this section we present two considerations with special importance for productive skills assessment tasks: choosing an appropriate assessment tool, and setting up speaking tasks. Feedback to learners should be clear, action-oriented, and linked to learning intents. A good assessment tool will make it easier for you to provide this sort of feedback. A good assessment tool will also help you make sound decisions about learner skills. It will be based on assessment criteria (which have in turn been linked to CLB-aligned indicators of ability), and will present the specific criteria for task success applicable to the assessment task. In line with principles of assessment for learning, the tool will also be presented in learner-friendly language, making the assessment process transparent to learners, and enabling them to use the tools to assess their own learning. You have many options for assessment tools; several are presented below, and others can be found in the CLB Support Kit (CCLBb, 2012). A checklist is easy to construct and use, and facilitates efficient feedback on performance. Checklists can be particularly useful for informal feedback when assessing for learning. When your purpose is assessment of learning, you will need to adapt the form to indicate the criteria for task success. Rating scales are also easy to construct, and allow the instructor to assess gradations of success in a task. A number of sample rating scales can be found in the CLB Support Kit (CCLB, 2012b, pp. 37, 93, 94, and others). Scales can be numeric (e.g., 1-5), descriptive (e.g., yes, almost, not yet), or even visual (e.g., happy face / neutral face / sad face emoticons). This flexibility makes it easy to develop level-appropriate rating scales. The CLB Support Kit also provides a useful overview of options for scales and other evaluation elements (CCLB, 2012b, p. 94). Rubrics present assessment criteria in a series of descriptors, according to level of success. They are complex and time consuming to develop and are most effective when learners have the opportunity to become familiar with them. They can be adapted for self-assessment, but because of the heavy language load, are most appropriate for use with higher level learners. The rubric below was used for a writing assignment in an academic bridging program, one of the classroom examples profiled in the 2005 edition of this resource package (Holmes, 2005). At the base of the rubric, the scores are interpreted and the criteria for task success given. Collecting evidence of learning from writing tasks is fairly simple: learners work on the assessment task, and the product of the task can be carried away for interpretation at a later time. Speaking tasks, however, present a few unique challenges. Traditionally, we have assessed learners’ speaking skills through one-on-one assessment interviews or class presentations. While there are advantages to these approaches, they have their limitations. Most importantly, they represent only two of the many speaking situations that learners will encounter outside the classroom, and relying heavily on them restricts the representative nature of assessment. In addition, both of these approaches are time-intensive, and because of time constraints, may not be used very often during a single term. A number of factors influence how you will set up a speaking task: the purpose of the task, class size, and time available. The table below suggests several options. Writing tasks naturally produce evidence that can be used to assess learner progress towards learning goals. Speaking tasks, however, do not produce tangible, lasting evidence, so assessment depends on either capturing assessment information in the moment, or recording evidence for later use. Advances in technology provide instructors with creative options for capturing, sharing, and assessing learners’ spoken performances. Many learners are familiar with the video applications available on phones and other devices, and as a result, are less intimidated by performing for a recording than might have been the case in the past. Learners also often bring these devices to class and are skilled in using them with very little set-up time. 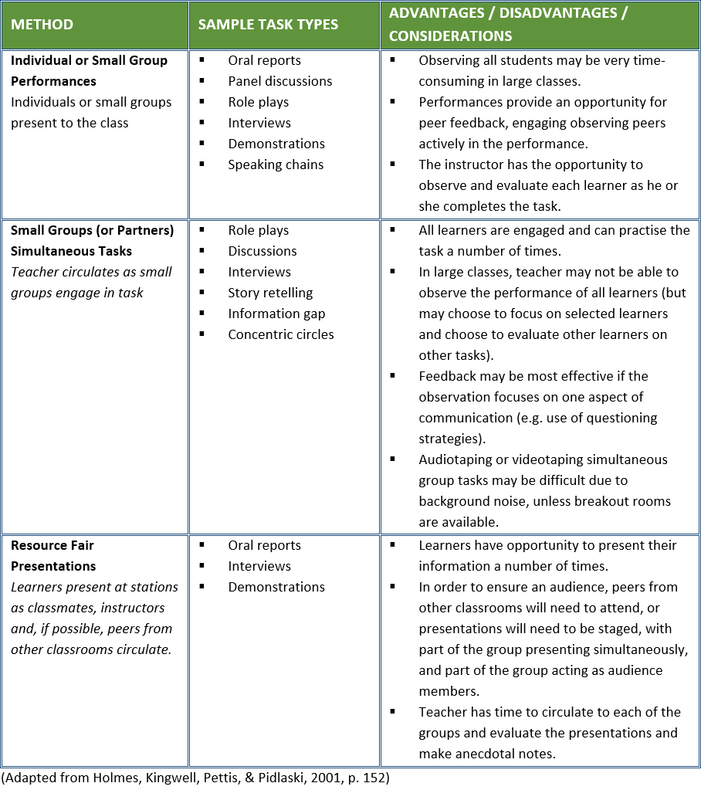 The table below presents a number of options for capturing and reviewing learners’ spoken performances, with relevant advantages, disadvantages and considerations. Consider a speaking task that you have used recently. Did you set it up as a performance (individual or small group), as simultaneous tasks, or as a resource fair? Brainstorm an alternative approach. What classroom management considerations would be important? If you needed to collect assessment information, how would you capture that information? Consider a writing assessment tool that you have used recently. Do you have holistic and analytic criteria? Have you focussed on a few key criteria? Review your assessment criteria. Are all equally important, or should you weight some criteria more heavily than others? Holmes, T. (2005). Integrating CLB assessment into your ESL classroom. Centre for Canadian Language Benchmarks: Ottawa, ON.